This recipe has almost everything a good, quintessential autumn recipe should: pork, dark greens, apple cider. I wanted to do something with my pork chops and the apple cider I had, but was hoping to break out of the pork chops & applesauce mode (mostly because I don’t have any of my mother’s applesauce, which is the only kind I will eat. She will probably send me some right away, after reading this). A little internet searching later, and I came upon this recipe, which had the added benefit of helping me use up the rest of my kale. I usually prefer kale raw or just par-boiled, even though it’s more bitter, because I rarely enjoy wilted greens, but the use of cider in here really mellowed the kale flavor and made the cooked greens tolerably good. The recipe was incredibly easy. 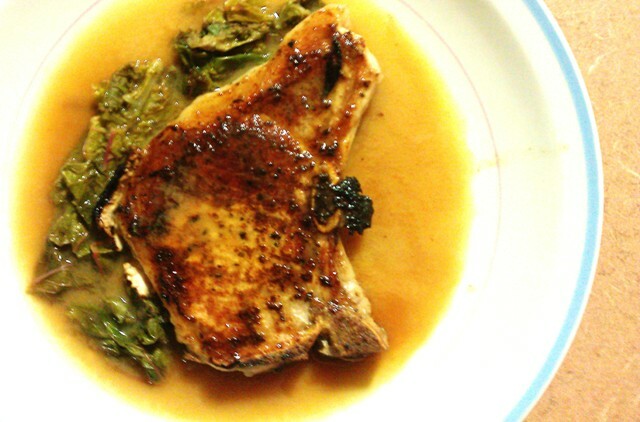 Though the original blogger grilled his pork chops, I did mine inside in a skillet. But I think grilling outside and making a warm cider reduction inside seems like the perfect way to honor the changing season — hold on to the nice weather while you can (and avoid setting off the smoke alarm) but bundle up inside when you need to. I love that this sauce sounds and looks so fancy. 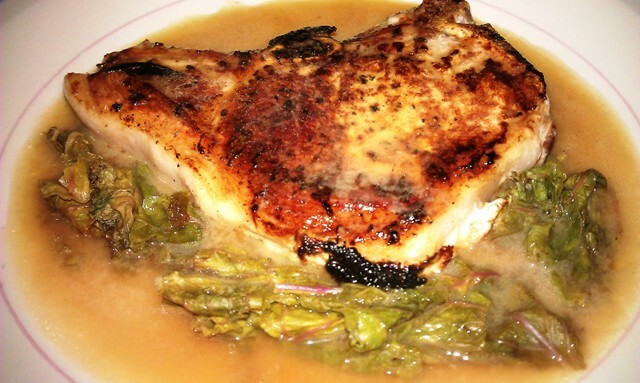 Being able to say you served a pork chop on a bed of kale with a mustard-apple cider reduction sounds so Top Chef, but the whole process took about fifteen minutes and very little work. The perfect recipe to celebrate the beginning of those yellow leaves falling… enjoy! What are your fall favorites? Leave a comment and offer me some suggestions to enjoy, whether as traditional as pumpkin pie or a little more wild!